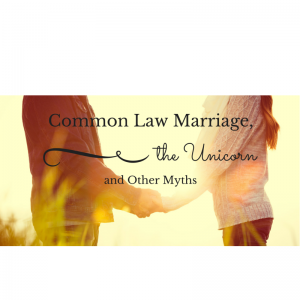 Common Law Marriage – one of the most persistent and most damaging myths there is when it comes to planning for your family. Contrary to popular belief, there is no such thing as ‘Common Law Marriage’ in England and Wales. However long you have lived together, however many children you have, ‘Common Law Marriage’ is a myth and offers no protection to you or your partner in the event of death, separation, or serious illness requiring ‘next of kin’ consent. Legally, if you die without leaving a will then any assets not in joint names (possibly even including your home) will automatically pass to your children. So if you are not formally married and you die without leaving a will, your entire estate could pass to your distant nephew in Australia or your estranged half-brother and leave the love of your life with nothing. Up to a point, yes. If you are living together, then the surviving partner is entitled to half of the value of any joint assets, but the other half (their partner’s half) becomes part of the deceased partner’s estate. If there is a will naming the surviving partner as sole beneficiary, then the estate will still be subject to Inheritance Tax if its value is above £325,000. There is no transfer of the deceased’s Inheritance Tax allowance to the surviving partner, as there would be if you were married. If there is no will, the estate (including the share of joint accounts and in property jointly owned) may be divided among blood relatives in the order listed above. If you are a father and you are not named on the birth certificate (or if your children were born before 2003), then you do not have automatic parental responsibility for your own children in the event that their mother dies and you are not legally married. If you are not legally married to the father of your minor children, have you considered who will be legally responsible for them (and for any inheritance that you leave to them) if you die without making a will? Do you know who your next of kin is? Some hospitals and other organisations will recognise your partner as your next of kin in the event that you are incapacitated and cannot consent to urgent medical treatment. However, they are not legally obliged to. So if someone is one day deciding whether or not to switch off your life support, have you specified who that person should be? Or who should manage your financial affairs and medical care if you are unable to? Talk to your legal advisor about Lasting Power of Attorney. Many people assume that if they have children together, the courts will recognise their non-financial contribution to the relationship in the event of a separation (for example, if a couple have made a private agreement that one partner will give up work to raise their children). However, while all non-resident parents are obliged to contribute maintenance towards their children, they are not obliged to provide any financial or material maintenance towards their former partner. The partner with main custody may be able to apply to stay in the family home until the youngest child is 18, but has no guaranteed financial interest in the property. So if you are a full-time Stay at Home Parent and your name is not on the deeds of the house you live in, you could find yourself starting again from scratch in the event of separation. Also known as ‘Living Together Agreements’, this is a document that you can draw up with the aid of a qualified legal expert. Along with a will, this can help protect you and your partner from nightmare scenarios such as those outlined above. Although Cohabitation Contracts are not legally enforceable, they may be taken into account by the courts in the case of any legal dispute. These are just some of the issues around living together that you may not have considered. To find out more about these and any other issues that may affect you, your partner and/or your children, we strongly recommend that you book a free consultation with one of our expert legal advisors today.